Beautiful handmade knitted baby blanket, incorporating 12 individually knitted squares featuring traditional Fairisle design and variety of stripes. 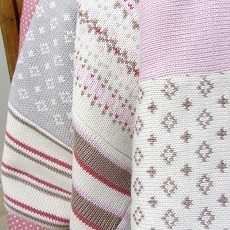 Knitted in pale and dusky Pink, silver grey, cream and taupe. This patchwork blanket is backed with a dusky pink fabric with white printed spots. All smitten baby blankets are lightly padded for extra comfort. This design is also available in blue.